This sweet Minnie Mouse cake is for Ava's 1st Birthday. It is a 6" and 8" stacked red velvet cake covered in light pink buttercream. 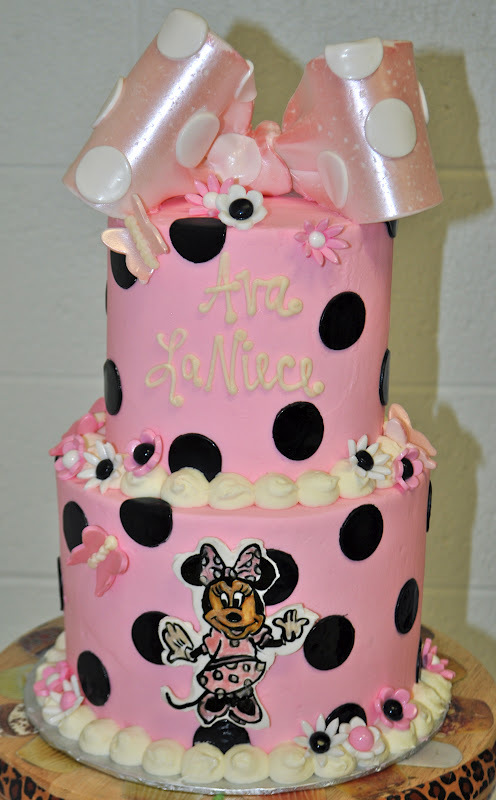 There is a big pink Minnie fondant bow on top, and Minnie was hand painted on gumpaste. This baby shower cake was made to match the "woodland" crib bedding. 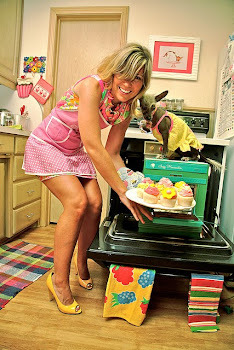 It is an 8" white cake covered in light yellow buttercream with green and tan fondant animals all the way around. There is a fondant turtle on top of a patch of buttercream grass. 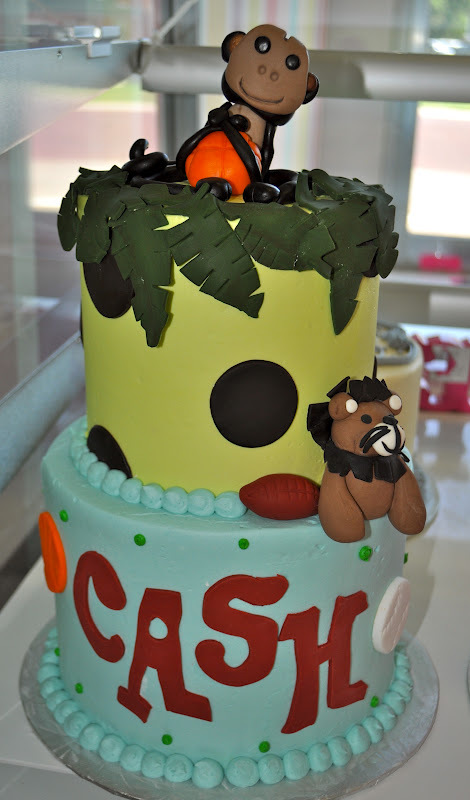 This baby shower cake was made to match baby Cash's bedding. It is a 6" and 8" stacked chocolate chip cake with a fondant monkey and lion. The letters match the letters hanging in Cash's room. This graduation cake was made with a baseball theme! It is a 6" 8" stacked square cake. The top tier is vanilla bean, and bottom is chocolate chip. 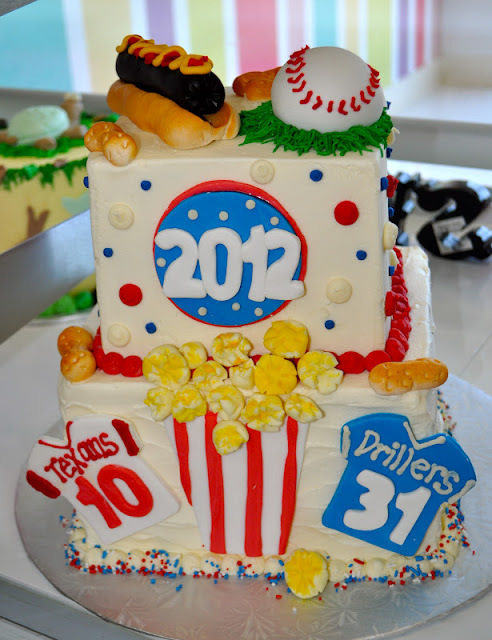 There is a fondant hot dog, baseball, peanuts and popcorn along with his baseball jerseys. So I will be the first to admit, I've never seen a star wars movie! I know, crazy right!? So I always hesitate when I get Star Wars orders-- but this one was too fun to pass up! Yoda's head was made from an 8" white cake dyed green. I think he turned out pretty awesome! This graduation cake was made for Trevor! It was personalized with all the things he loves: xbox, the tuba, red crocs, math equations, and hoarding his money! It was a 6" and 8" stacked peanut butter chip and cookies and cream cake. Way to go Trevor! Congrats! 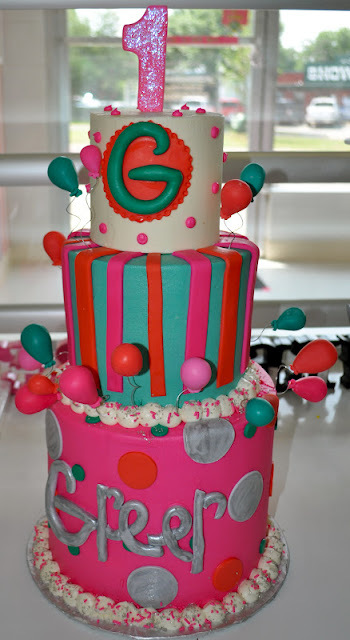 This Balloon themed birthday cake was for Greer's first birthday at rollerland! 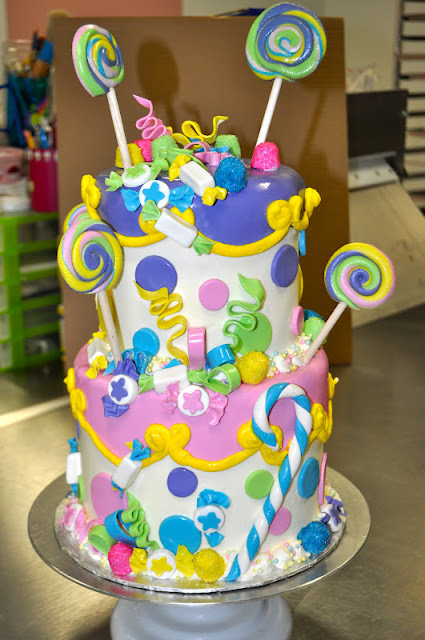 It was a 4" 6" 8" stacked with fondant balloons coming off the second tier. The top tier was to come off for her smash cake. There is a glitter fondant one on top. This precious candy land themed cake was made for a mother daughter tea party! How fun! 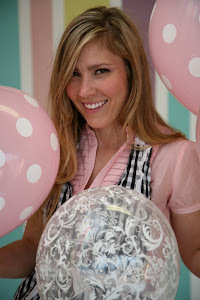 The top 6" tier was a pink champagne cake and the bottom tier was vanilla bean. 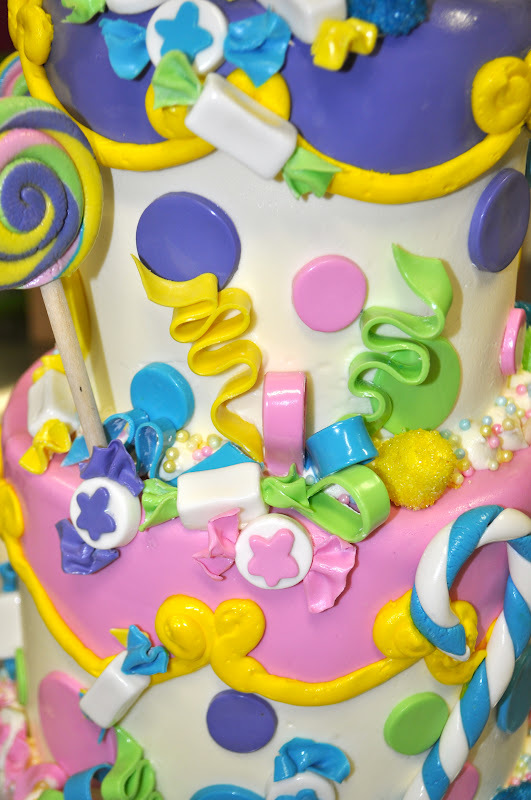 There are tons of fun fondant details- candies, gum drops, ribbons, suckers. 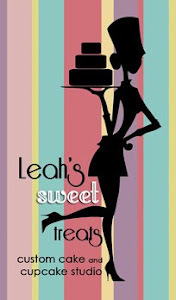 What a great theme for a tea party! This cake was for a Safari themed baby shower with green and browns as the theme colors. It was a 4" and 6" stacked white cake with a cute fondant lion and leaves on top. The bottom polka dots have a slight ombre affect. 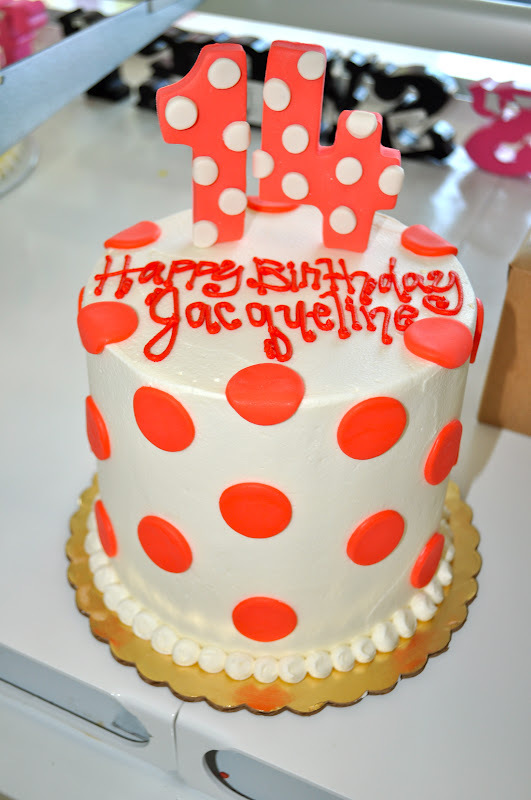 Coral must be a hot trend right now because we have had many requests for cakes with coral as the main color. This one was for Jacqueline's 14th birthday. Simple and Sassy! 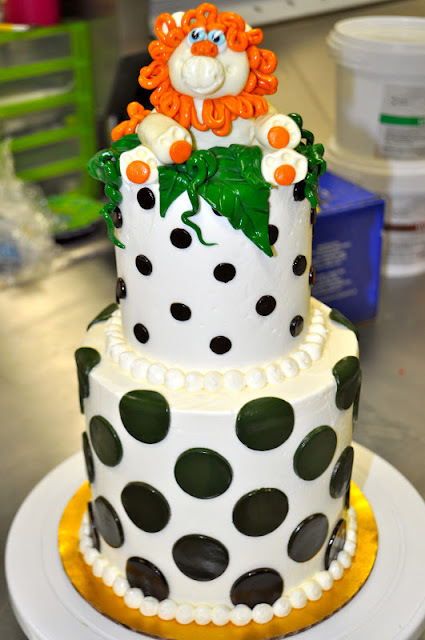 It is a 6" confetti cake covered in buttercream and coral fondant polka dots. 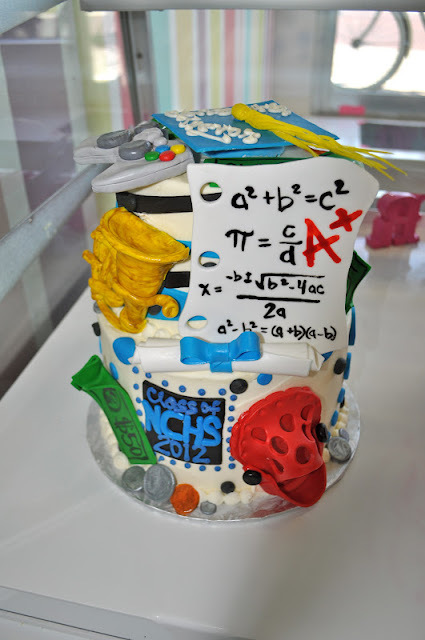 What a fun smash cake this was! 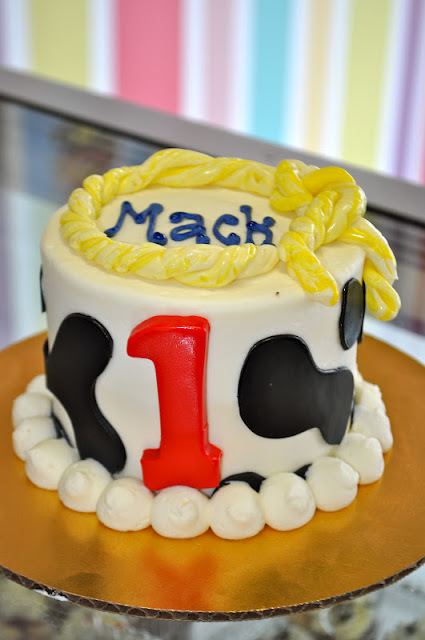 It was for a first birthday party that was being held at McDonalds. The cake is made from a 4" white cake with fondant "toppings" the fries and ketchup bag are also fondant, the "ketchup" is red buttercream. This Western themed cake and smash cake was made for Mack's first birthday party. 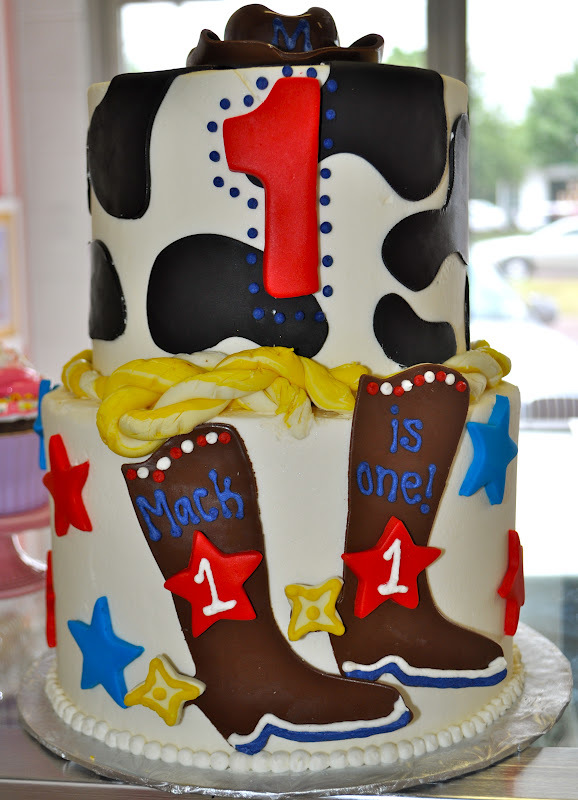 The big cake is a 6" and 8" stacked whtie cake with a fondant hat, 1, boots, and rope. 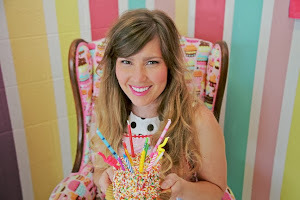 The smash cake is a 4" white.